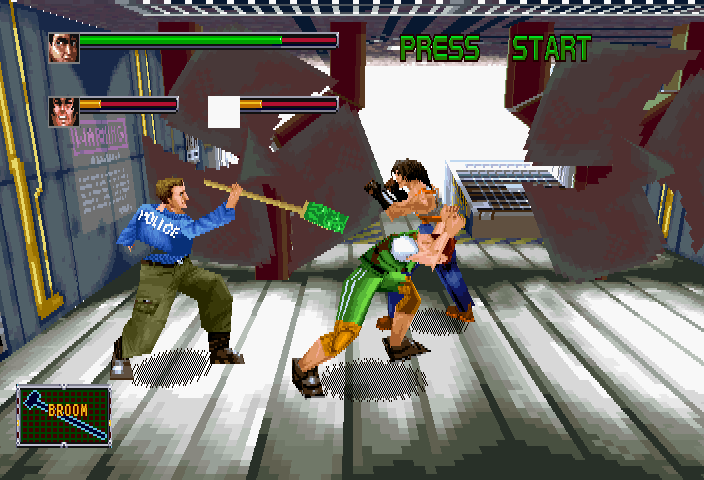 Scrolling beat-em-ups have long been associated with sprite based games like Final Fight and Streets of Rage, yet there was a brief period of time where the genre went 3D. These experiments are not fondly remembered, although that’s a rather unfair assumption. Eidos’ Fighting Force may have been mediocre, but Sega’s Dynamite Deka series is an exemplary effort, updating the mechanics substantially and coating it in luscious 80s Hollywood action movie-style cheese. 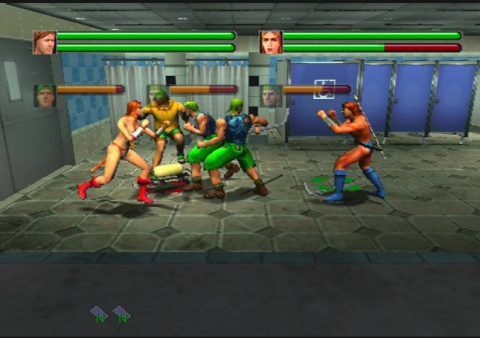 The games were overseen by Makoto Uchida, who had also been in charge of several of Sega’s classic beat-em-ups, including Altered Beast, Golden Axe, and Alien Storm. The naming conventions of the series are a tad confusing due to licensing. The plot is strikingly similar to the movie Die Hard, to the point where the main character looks much like Bruce Willis, even right down to his wifebeater-and-jeans outfit. In North America, Sega obtained the license for the movie and called it Die Hard Arcade. In Japan, there is no official connection with the film and it is simply called Dynamite Deka (“Dynamite Detective”). Whether it was designed specifically with the license in mind, or whether it was simply ripped off and the license obtained later, is currently unknown. The sequel does not have any affiliation with the movie in any territory. 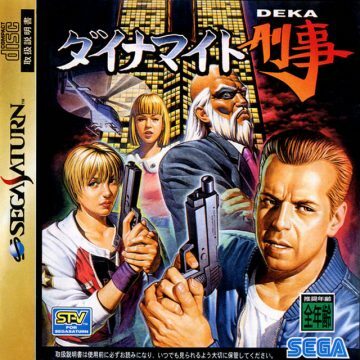 It is known as Dynamite Deka 2 in Japan, and Dynamite Cop (offering a close translation of the Japanese name) in North America. 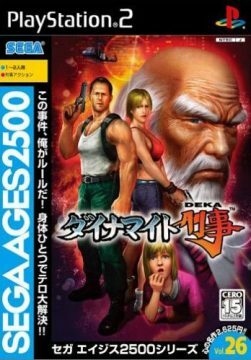 A third game, released only in Asian territories and actually a variant of Dynamite Deka 2, is known as Dynamite Deka EX: Asian Dynamite. 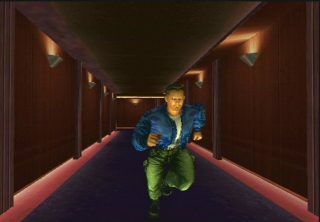 Terrorists have taken over Eternal City, a skyscraper in San Francisco (in the Japanese version) or Los Angeles (in the American version), intent on stealing the vast riches from a vault in the penthouse office, and taking everyone hostage. Perhaps more important than the cash, they’re also kidnapped the President’s daughter. 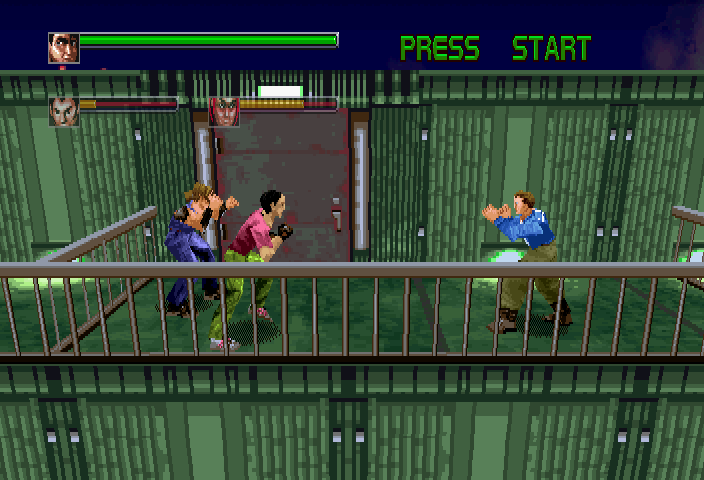 As two police officers, (John McClane or Kris Thompsen in the American version, Bruno “Mister Dynamite” Delinger and Cindy Holiday in the Japanese version), you must infiltrate the building through its ventilation systems and fight your up to the top to face off against Wolf Hongo, and save the day, as expected. The parallels to Die Hard are obvious, though since the building and characters are different, technically it’s just a parallel situation, with the president’s daughter added in for an extra bit of ludicrous melodrama. 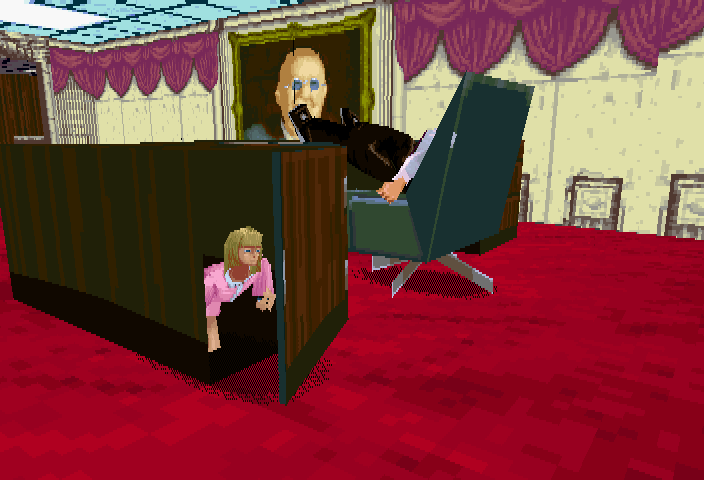 In fact, there’s a running gag that the girl has eluded the kidnappers and is hiding right underneath their nose the entire time, but the terrorists are too daft to find her. 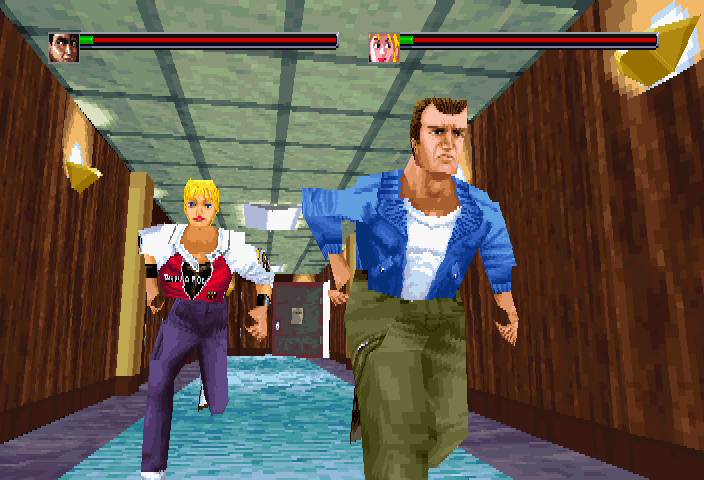 Sega had quite a number of arcade beat-em-ups under its belt by 1996, but Die Hard Arcade is the first to go 3D. It still looks very much like a product of its era, complete with low polygon models and blocky textures, but the high resolution and smooth frame rate put it in a better class than most PlayStation games, and is easily up there with Nights as one of the best looking games on the Saturn. 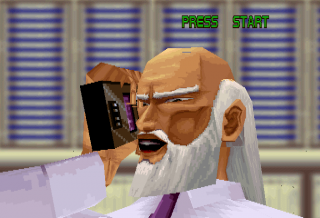 The extra dimension allows for impressive cinematic cutscenes, even though they’re expectedly goofy. The camera is always fixed it an overhead angle, but occasionally swoops downwards and upwards in line with the action to make it look more dramatic. 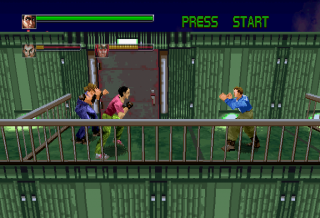 Your characters’ clothes also tear off as you continue, so for example, while Bruno starts off in full police gear, eventually he’s reduced to the wife-beater-and-torn-slacks combo made famous by Willis in the movie. The extra dimension also means that it controls completely differently from its 2D counterparts. 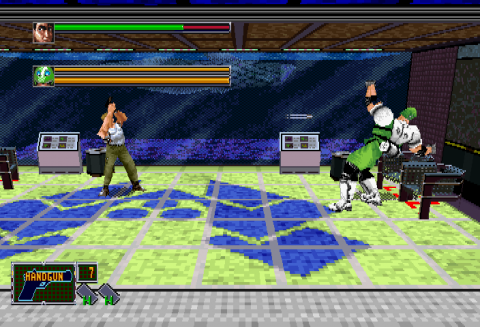 The attack movements are quick and snappy, making it feel a bit like Virtua Fighter. 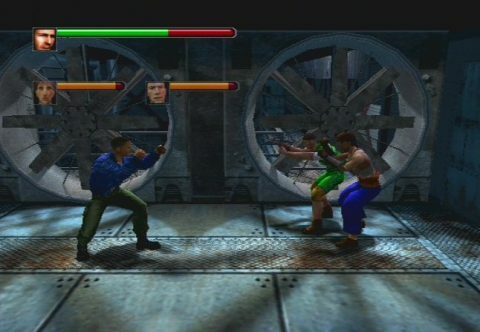 There’s a punch and a kick button, with a number of combos and grabs depending on button presses, as well as a jump button. Generally it plays well, though it’s not without its quirks. Like the days of old, your characters can only face left or right, which made sense with sprites but is incredibly awkward looking into 3D. And since the jumps are meant to be more realistic, it also means they aren’t nearly as fast or as effective. There are only two characters, for the first and second player, and each controls identically, so there’s not a whole lot of variety either. 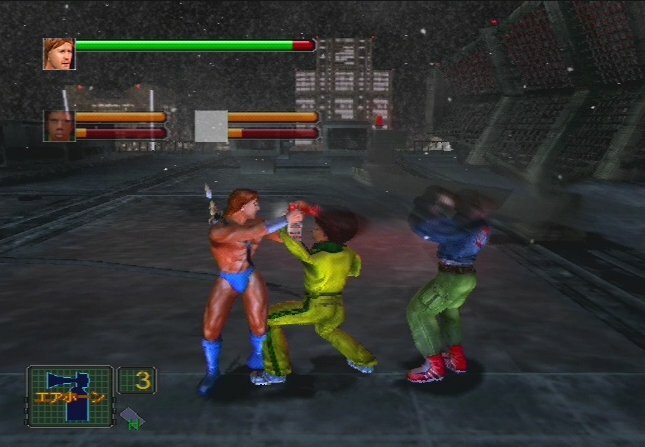 There’s also a noticeable lack of any screen-clearing or crowd control special moves, but this is made up for with the copious amount of weapons. Most screens have at least a few objects that can be picked up and used to bash enemies (or used to bash you), as well as a handful of guns and other projectile-firing weapons. Most amusingly, even though you can blow up enemies with missile launchers and anti-tank rifles, they’ll usually shake the explosions off with just a bit of minor damage. You can also use these weapons at point blank range without taking any damage, a true indication of ridiculously Hollywood-style bravado. You can collect handgun clips even if you aren’t equipped with it, allowing you to store them up whenever you need them. 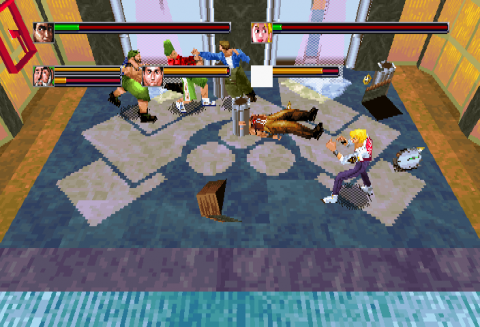 You can also arrest enemies (similar to NARC), which is slow but immediately removes them from the playing field. Many screens also have environmental obstacles that can be used to your benefit (or detriment), like the fire truck in the basement that moves back and forth spraying water. There are five stages in total, and most of it is very similar to the movie, with the exception of four-legged robots in a few areas, which are silly. Still, you can pick up their dismembered legs and proceed to beat them into submission, so it’s all in good fun. 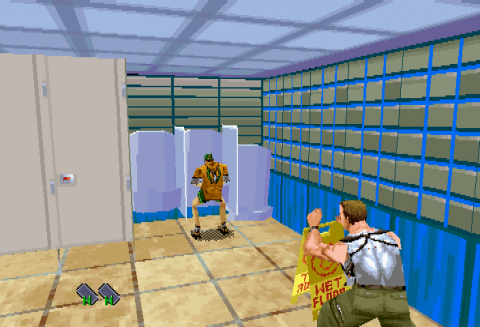 It’s got a good sense of humor of itself, especially when you walk into the bathroom and find a bad guy casually relieving himself in a urinal. Then some guy clad only in underwear breaks out of a stall and proceeds to terrorize you. You no longer traverse levels in a traditional manner, by moving left to right. 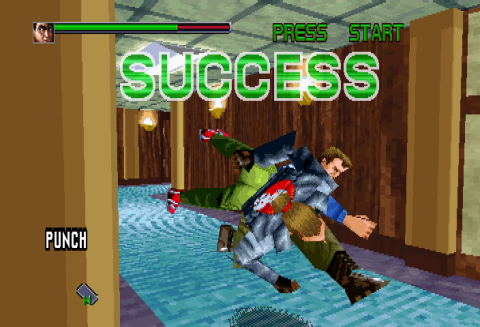 Instead, upon conquering each screen, your character(s) will take off and automatically move to the next destination. Usually in between these are quicktime-style cutscenes, where you’re given a few seconds to hit a certain button to avoid an enemy attack. Hit the right button and you’ll escape danger, but fail, and you’ll either take extra damage or be forced into an extra confrontation. Either way you’ll be shown slow motion recaps applauding your success or bemoaning your incompetence. 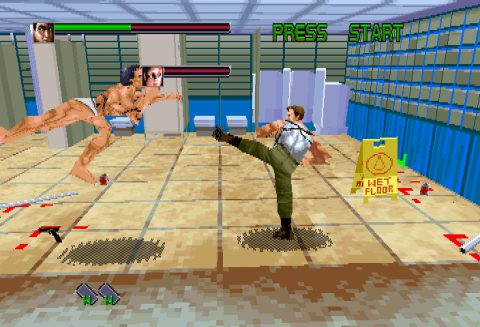 Die Hard Arcade was developed as a joint production between Sega AM1 in Japan and Sega Technical Institute in America. The former handled the design and programming, while the latter handling modeling, as well as providing the soundtrack. 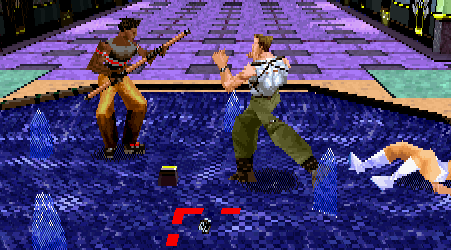 Sega mainstay Howard Drossin composed the music, which is appropriately over dramatic and cheesy in the best way. Unfortunately the number of songs is limited, so you end up hearing the same music throughout the entire game. 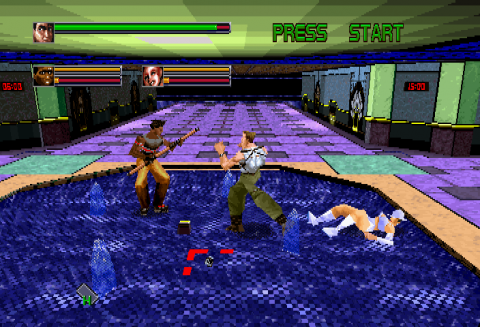 In 1996 the game was ported to the Sega Saturn. 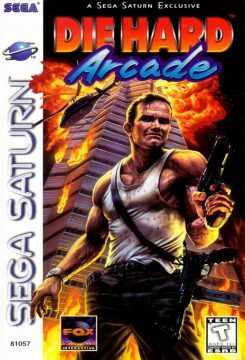 Considering the arcade version ran on the ST-V hardware, which is almost functionally identical to Sega’s 32-bit console, it’s a nearly perfect port. The only major downside is that the music is all redbook audio played directly from the CD, which means it fades in and out as it loads each new screen. The pauses are brief, but noticeable. 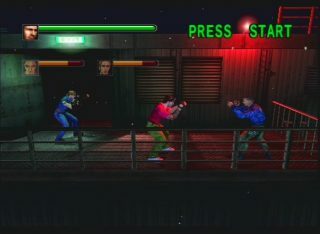 Despite its quality compared to similar games, Die Hard Arcade didn’t exactly get the same warm reception as games like Streets of Rage. By this time, consoles were moving away from quick arcade-style games to longer, more intricate experiences – and this button-wailing, 20 minute long didn’t exactly gell with that. 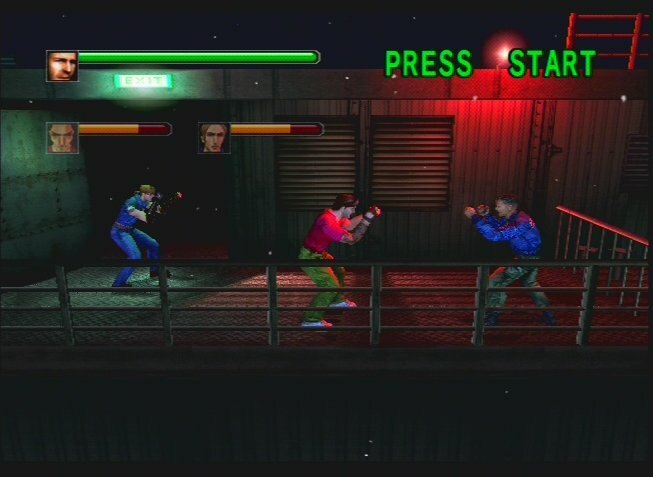 Strangely, while the arcade version allows you to modify the difficulty, granting longer health bars and extra lives, these options are missing from the Saturn version, granting you, by default, only a single lift and three credits. 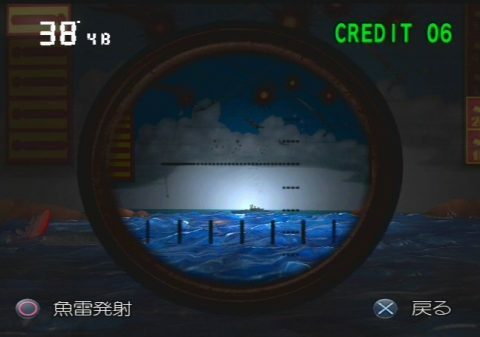 As a bonus, you can play a ported version of the 1980 Sega arcade game Deep Scan, where you control a boat dropping depth charges on submarines. The higher the score, the more credits you get when playing the main game. There’s also an extra, hidden soundtrack enabled through a code, but it’s mostly the same as the arcade version with slightly different instrumentation. 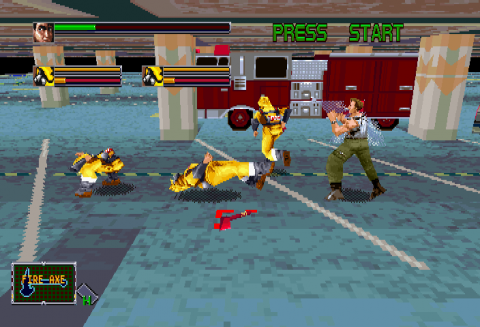 Easy mode allows the characters to dress up as Ax Battler and Tyris Flare from another classic Sega game, Golden Axe. 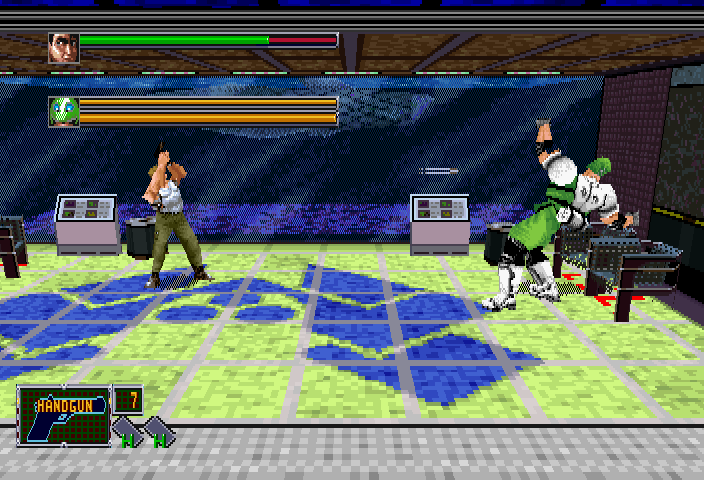 The third stage boss, the huge football player dude, has been changed into Death Adder. This whole fight includes a ton of Golden Axe references – the giant fish in the aquarium has been changed into one of the monsters, and all of the furniture has been changed into statues of different Golden Axe characters. The music has even been changed into the classic first level theme. The other modes allow you to dress up in other different costumes – in One Hit Kill mode, you are dressed as Elvis and one of the characters from the young girl-oriented Sega arcade game Oshare Majou; Arrest Mode puts you in the shoes of the samurai Touyama Kagemoto and a girl dressed as Santa; and Deadline Mode casts you as Segata Sanshiro and a character from the manga/anime Sukeban Deka. 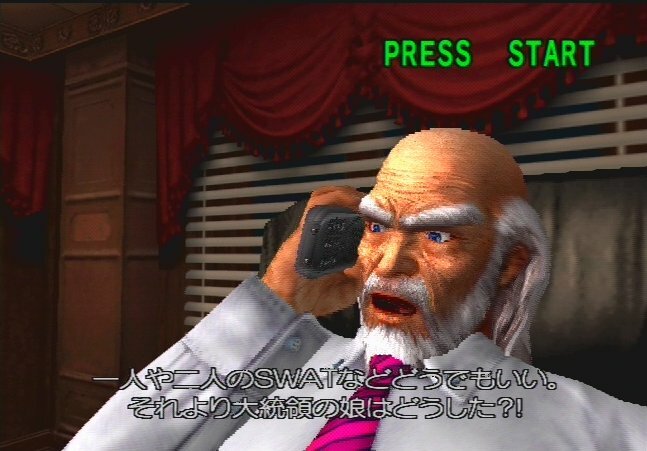 There are even small references to other Sega games by Makoto Uchida like Wing War, Alien Storm and Alien Front Online, in the forms of posters on the walls. In addition to all of this, there’s an art gallery and a short Japanese commercial. The Saturn version included Deep Scan, an incredibly ancient Sega game where you drop depth charges on submarines in order to earn more credits for the main game. This has been replaced with Periscope, a 3D recreation of an even older Sega coin operated game from 1968, predating most video games. You need to shoot missiles (denoted as blinking light bulbs) at battleships (which were little plastic models in the original version). It’s a fascinating look at Sega’s history – it’d be amazing if Sega would release a package filled with recreations like this.